Silkscape Arts Skyscape Gallery - "Jupiter Jumbo"
Photograph above is of the actual replica. Battle of Britain Memorial Flight (BBMF) Replica. The Royal Air Force BBMF Spitfire image (above) is the actual, 1:110.5-scale model being offered. There are very limited numbers of the model available. The Spitfire replica is a high quality, die-cast model, not plastic, with actual historical markings of the Royal Air Force's BBMF (Battle of Britain Memorial Flight) painted on with great detail, not pressed or decals, which are the actual markings of the aircraft that took the fight to the Nazis in WWII, and each aircraft features a unique display stand and has a free-spinning prop. The wingspan is 4 inches, making it a respectable display piece, or a great gift for appropriately-aged kids. 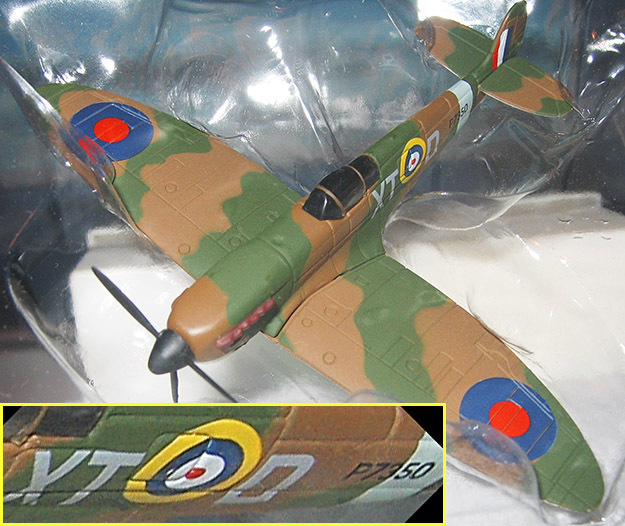 Retailers, such as the Smithsonian Store, sell replicas of this size and type for $16, plus $8 shipping, so dor this Spitfire, the $15 cost, plus $5.25 shipping, is very competitive. 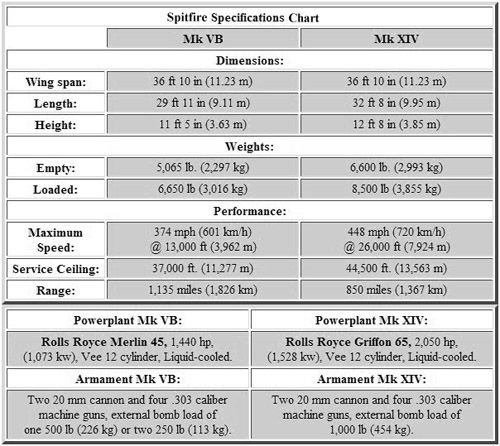 Directly above is a photo of the real-life, in-flight, BBMF Spitfire from which the replica being offered is based, with the very same XT-D and P7350 designations and markings. Beautiful image of a X-TW BBMF Spitfire, much like the replica. Plus, with any order, you’ll also receive, by e-mail attachment, your choice of a 1024-, 1280-, 1366- or 1920-wide digital image of the Going Home photograph, with the High Flight (HF) text overlay (selection options are in both order sections below) to use in your screensaver or wallpaper list. To request information please e-mail using the e-mail link below or on the gallery main page. When ordering, please select your digital-wallpaper size and be sure you are clicking on the order button that is below the image you want, with or without the High Flight text overlayed onto your print (adds $5). With purchase of the BBMF Spitfire replica, you’ll also have the option, for only $8 additional, to also receive the laser print of the verse, described on the main gallery page, on gold-border paper, suitable to frame and hang in conjunction with your replica of the Spitfire. That’s a near 60-percent discount on the verse print. Each print is custom made and inspected. Returns for refunds cannot be accepted. The BBMF Spitfire replica without High Flight Laser Print with Gold Trim is $15, plus $5.25 insured U.S. delivery. Please select the "U.S. Address" radio button below. The price for military personnel shipping to APO and military-base addresses is $20.25, insured shipping included. Please select the "Military Base/APO" radio button below. Regret military discount is not available on this item due to extremely limited quantity, but Laser Print package below is reduced. Your service is appreciated! International delivered total is $25.75 Please select the "Int’l" radio button below. 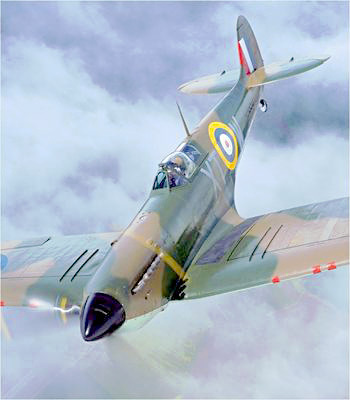 Click the order button below to order the BBMF Spitfire replica WITHOUT High Flight Laser Print. Photograph copyright © Silkscape Arts. Viewed on a 19-in. monitor at 1024x768, the full replica in the photo above is 10.5-in. wing span (2.63X larger than the original's 4-in.). This replica is provided by popular request. It is an actual, historical representation of one of the most revered aircraft in aviation history, the famous British Spitfire that was Great Britain's only shield against the Nazi bombing onslaught in the Battle of Britain, for which the High Flight author, John Magee, Jr. The actual model is shown again (above) inserted in the lower half of its blisterpack clam-shell packaging. The inset enlargement section (bordered in yellow) is 2¼-times larger than the whole image replica section, and 8X larger than the actual aircraft replica, and the paint detail is clearly seen; although, on the actual model, it has a much smoother finish—a jewel. 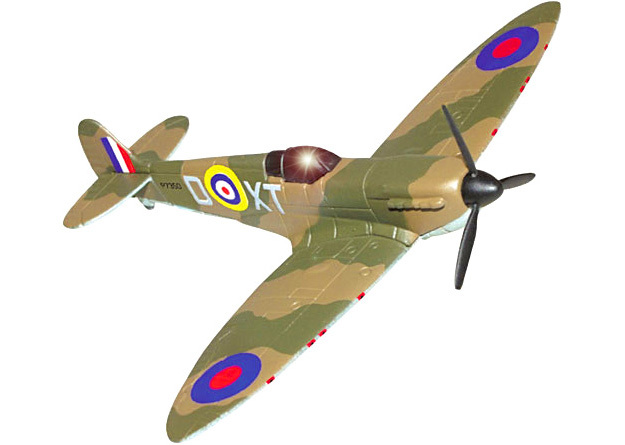 The BBMF Spitfire replica with High Flight Laser Print with Gold Trim is $23, plus $5.25 insured U.S. delivery. Please select the "U.S. Address" radio button below. The price for military personnel shipping to APO and military-base addresses is $24, insured shipping included. Please select the "Military Base/APO" radio button below. Regret military discount is not available on this item due to extremely limited quantity, but Laser Print package below is reduced. Your service is appreciated! International delivered total is $35. Please select the "Int’l" radio button below. Click the order button below to order the BBMF Spitfire replica WITH High Flight Laser Print.